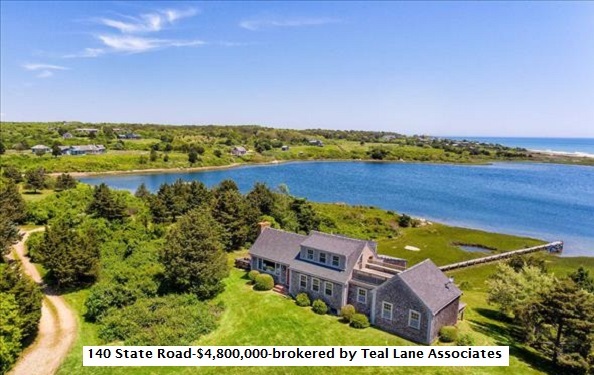 Home Real Estate Confidential Sponsored: Real Estate Confidential: What’s the story with Chilmark? Sponsored: Real Estate Confidential: What’s the story with Chilmark? 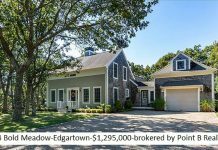 Real Estate Confidential is a weekly chit-chat about new listings, sales, or other insider info on the Martha’s Vineyard Real Estate market, by Fred Roven, Martha’s Vineyard Buyer Agents. It appears each Friday in The Minute. 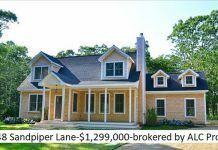 If you are considering purchasing luxury property on Martha’s Vineyard and you want the best assurance of continued growth in value, look no further than Chilmark. In 1984 there were 2,326 lots on the tax rolls and in 2018 there were 2,348, with an increase in year-round population from 499 to 1,193. During that time period, the total number of homes went from 948 to 1,610 (less than double) yet the total valuation of real estate went from $180 million and change to $3.275 billion. Percentages almost miss the point; that is an 18 fold increase in valuation with less than double the number of homes. Folks who bought a property in Chilmark during that period of time knew what they were doing or had an angel looking over their shoulder. If you want to truly escape and avoid the summer crowds then head to Chilmark. The further west you get on Martha’s Vineyard, the more rural it becomes but also the more breathtaking the views. So if you want to hang out at Lucy Vincent beach (or let it all hang out at the clothing-optional section of that beach) then you need to be in Chilmark. The town of Chilmark offers some of the most spectacular views of unspoiled land, rolling meadows, and brilliant sea. The town center is marked by a lovely church, as well as a general store featuring a spacious down-home porch where visitors and natives alike gather throughout the day to feast, chat and share the latest local tidbits.The visual trademark of Chilmark, just west of West Tisbury, might well be the stone walls that wind their way through rolling fields and forests, recalling the day when vast expanses of the Island landscape were open land, devoted to sheep farming. You’ll still see a working sheep farm if you look south from the South Road across the fields of Allen Farm to sweeping vistas of the Atlantic. Just a ways to the north is Menemsha, a picturesque fishing village which, remarkably, has kept much of its old New England character. The beach at Menemsha draws people all summer long, and is especially popular as the best place on the island from which to watch a colorful sunset. 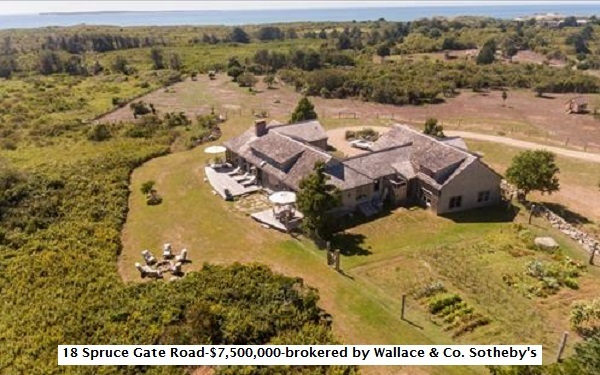 All of this leads to the priciest real estate on Martha’s Vineyard. A prime example is the Tom Tate designed home at 3 Eliot Avenue designed to work with the landscape to maximize the spectacular water-views. 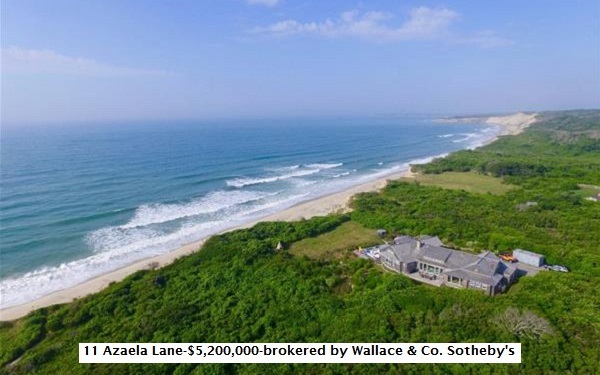 The views are truly endless; sunrises and sunsets with panoramic views over Nashaquitsa and Menemsha Ponds, the Elizabeth Islands to the North and Menmsha, stonewall Ponds and Atlantic beach and ocean to the south. The home has been thoughtfully designed with both year round living and summer entertaining in mind. It’s a short stroll to Stonewall Beach and the boat launch on ‘Quitsa pond. For some reason I have not discussed the idyllic beach house at 21 Squibnocket Road in previous columns. 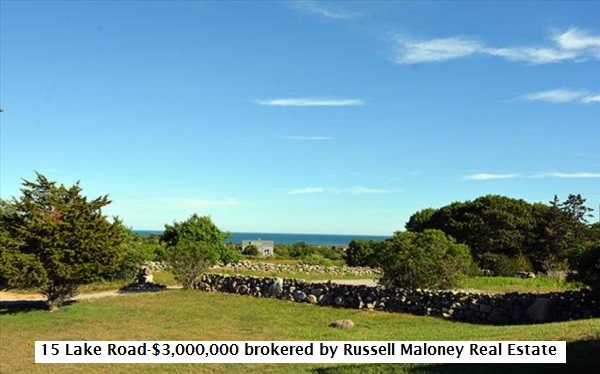 The property looks out over Squibnocket Pond and Beach with amazing views of the Atlantic Ocean and shoreline and out to Squibnocket Point. The property is surrounded by stone walls, a bluestone patio facing the Atlantic, and a path to the Pond. This property was for over 80 years the haven for the international modernist painter Vaclav Vytlacil and his family. Walk to the beach, kayak in the pond, or just sit out on your patio watching the day unfold, osprey fish and surfers ride the waves. In a neighborhood often described as the finest waterfront community on the East Coast sits 18 Spruce Gate. 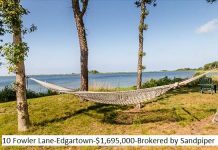 The 500-acre community that includes over three hundred acres of conservation land, private waterfront on Squibnocket Pond, miles of sand Atlantic Ocean beach with only 16 homesites contains this turnkey offering which melds modern construction and comfort with an idyllic farm-like setting. The exterior design evokes traditional New England farmhouse style, with multiple gables and cedar shingles defining the facade. Views of the ocean, Squibnocket Pond, Noman’s Land, and open fields are readily available from many rooms. The property offers nearly 3 acres of fenced pasture as well as permits for a pool and horse barn. 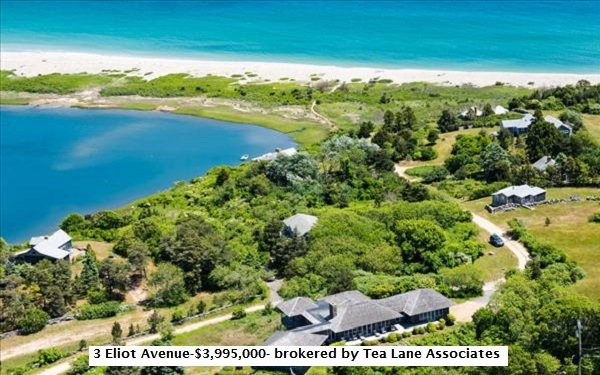 Ownership in Squibnocket Farm provides access to miles of trails, multiple accesses to Squibnocket Pond, and access to the exquisite homeowners beach, which is home to some of the most stunning sandy beachfront and dunes on the Atlantic seaboard. 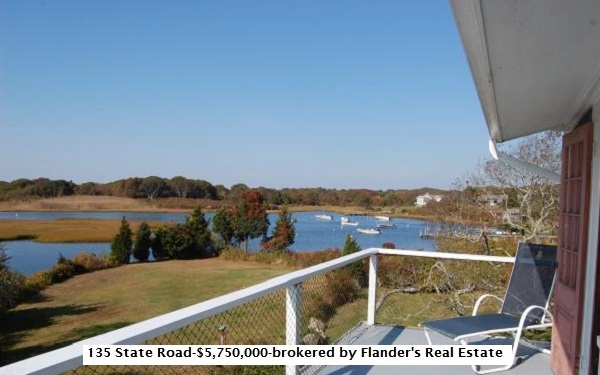 140 State Road is a spectacular waterfront property with private dock on Stonewall Pond. 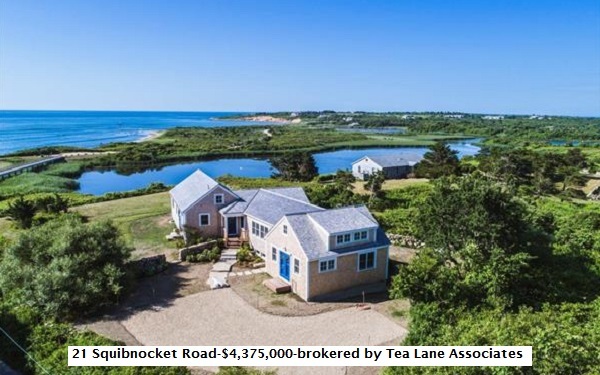 Breathtaking one-of-a kind views across Stonewall Pond out to the Atlantic Ocean as well as stunning views of Quitsa Pond. With modern upgrades, this is a year round home which evokes old Vineyard charm and features water views from almost every room. You can dine al fresco on one of the 2 large decks and enjoy magical moon-rises and spectacular sunsets with 360 degree water views from the rooftop deck. Stroll down the gently sloping yard to a private dock and enjoy sailing, kayaking, swimming and paddle boarding. The sunrises and sunsets here are breathtaking and watching the moon rise over the pond is spectacular. 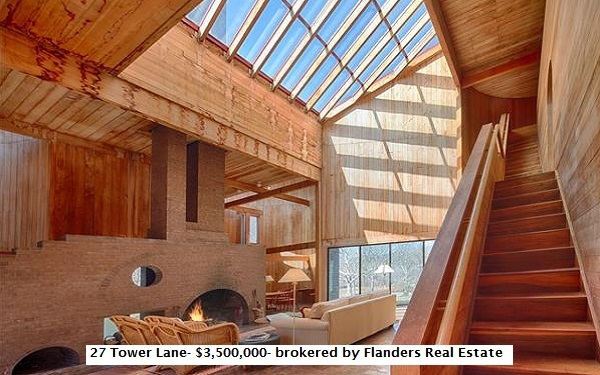 Click here for a complete list of these and similar Chilmark luxury homes.